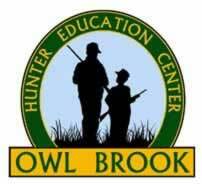 The NH Fish and Game Department's Owl Brook Hunter Education Center is dedicated to educating people in the knowledge, skills and behaviors needed to become safe and responsible hunters, trappers and stewards of the state's natural resources. Owl Brook is managed by Fish and Game's Hunter Education Program. Located on 500 forested acres of land at 387 Perch Pond Road in Holderness, NH, the center was the first facility of its kind in the state. Owl Brook hosts workshops, group programs and special events conducted by Fish and Game staff, Hunter Education and center volunteers, often in partnership with organizations such as the NH Trappers Association and the National Wild Turkey Federation. These activities allow individuals and families to start the lifelong journey of becoming safe and responsible hunters and trappers. As much as possible, the "hands-on" and "learn by participation" approach is used at the center. Owl Brook Hunter Education Center was made possible through a grant from the Federal Aid in Wildlife Restoration Act (managed by the U.S. Fish and Wildlife Service), as well as private donations, including support from the Wildlife Heritage Foundation of New Hampshire. Pass on the Heritage: Volunteer at Owl Brook! Owl Brook Hunter Education Center relies upon volunteer assistance from the state's sporting community to accomplish our mission. The center offers basic, advanced and special opportunity classes and workshops on hunting, trapping, shooting, outdoors skills and wildlife management. The center's classroom building, shooting ranges, and interpretive trails and courses are important tools helping Fish and Game pass on the heritage of hunting and trapping to future generations. For more information on the Owl Brook Hunter Education Center, call: (603) 536-1290; or write to Owl Brook Hunter Education Center, 387 Perch Pond Road, Holderness, NH 03245. The Owl Brook Hunter Education Center and Hunter Education in New Hampshire are made possible by the Federal Aid in Wildlife Restoration Act. Excise taxes are collected from the sales of firearms, ammunition and archery equipment. These funds are distributed to state agencies to conduct research, manage wildlife populations, protect habitat and conduct hunter education programs. It's a great example of a user pay-user benefit system. Hunters and target shooters ultimately pay the excise taxes. They enjoy the benefits, namely opportunities for safe and satisfying hunting. Educating safe and responsible hunters in New Hampshire wouldn't be nearly as successful as it is without the Federal Aid in Wildlife Restoration Act. 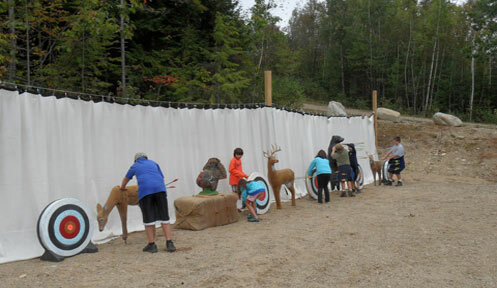 There are over 500 volunteer hunter education instructors in New Hampshire. Their donated time is used as a match, enabling Fish and Game to receive enough federal funds to cover the entire costs of coordinating New Hampshire's Hunter Education Program. So the next time you buy a gun, ammunition or archery equipment, remember that you're helping to fund wildlife management and hunter education.